Having quietly evolved from a small alleyway restaurant in Paris’ garment district to a collective that now includes a wine bar, takeaway shop and wine store, the Frenchie group has now set its sights on London. Led by Greg and Marie Marchand, a husband and wife team with extensive experience in the restaurant industry, it’s hardly a blind foray into the capital. Greg’s CV reads like a guide to London’s dining scene, with lengthy stints at the Mandarin Oriental, the Savoy Grill, Electric House, and Fifteen, where he picked up the moniker ‘Frenchie’. 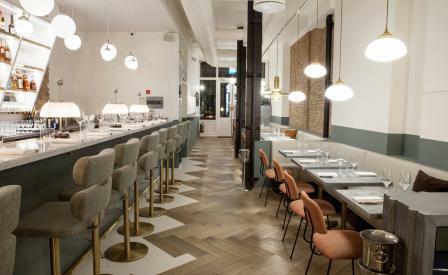 It was this affinity with the city that led to the opening of this two-floor, 60-seat restaurant based in Covent Garden. The space, conceived by French set designer Emilie Bonaventure, is a lesson in restrained drama, with whitewashed walls and exposed brickwork peppered with brass, copper and zinc, and leather banquettes, all bathed in natural light. A concise menu gives gentle nods to Greg’s international travels, spanning New York to Spain, with the flavours of his French hometown, Nantes, being the consistent thread that runs throughout.